Open your chicken coop in the morning. Bring your kitchen compost container with kitchen scraps with you down to your chicken coop. Kitchen scraps go to the compost bin daily along with your chicken manure. Briefly look at your chickens for general health and well-being. Check the waterer, or water system, to make sure your chickens have fresh water. 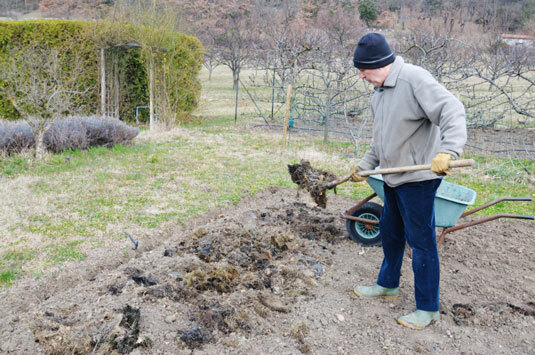 Clean the manure box by skimming and scooping manure into your muck bucket. 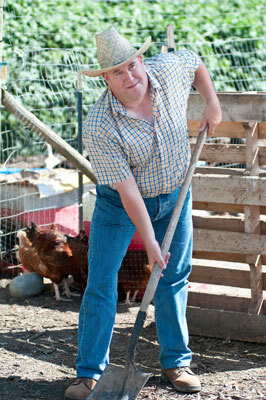 A muck bucket is a bucket that is specifically, and only, used for transporting manure and soiled chicken coop bedding. Take the muck bucket and kitchen scraps to your compost pile. Collect eggs every day, preferably at least twice a day, preferably at the same time. Keep a journal of egg count, if you desire. Check the chicken coop thermometer when it’s extremely hot or extremely cold outside. When these extreme temperatures occur, take appropriate action to make your chickens more comfortable. 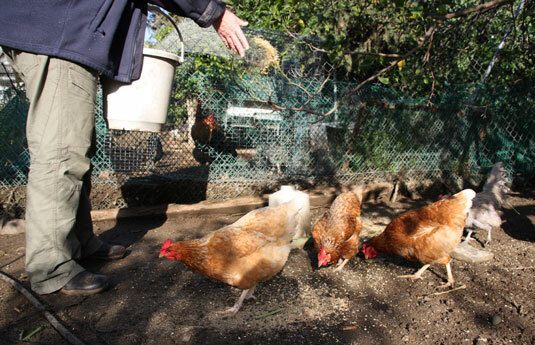 Open up the coop to the outside pen, or allow chickens to free-range in your garden, if this is your normal routine. Daytime rituals vary by season and regional weather conditions. Provide treats as a special daily ritual sometime during the day. At dusk, close up your chickens once they are back in their coop and up on their roost for the night. Close up all outside doors and gates securely, whether your chickens were in their secure outside pen or ranging in their runs or zones. Remember to give them ventilation, or air circulation by leaving a vent or wire-protected window open. Night rituals vary by season and regional weather conditions. If any of your chickens fail to return to their chicken coop, call them and/or look for them until you find them. If you have trained your chickens to come with a pet clicker, use that. If by chance a hen has been injured, or a surprise attack has frightened your flock, become very quiet to listen for them, and call their names. If they are able, they will make soft noises responding to you. 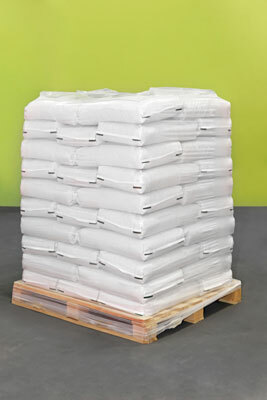 Take the feed bucket back to the storage room, and store it in a clean metal utility/garbage can. Turn over compost pile, either manually with a pitchfork or giving your chickens liberty to turnover and aerate your compost pile. Troubleshoot any fencing, garden irrigation, or predator evidence. Clean and disinfect chicken waterers if they are dirty and/or forming green algae. Algae forming occurs in warm weather. Rotate fresh chicken coop bedding if the bedding is dirty or getting depleted from bedding rotation. Engage in some form of ongoing rodent management. Where there are chickens and chicken feed, there are rodents. Buy feed at the feed store. You may need to buy it more often. One metal utility garbage can hold 100 pounds of chicken feed comfortably. Keeping feed fresh for your chickens depends on how big your flock is, and what kind of storage accommodations you have. Clean the chicken coop, dusting, sweeping, and removing all bedding. Disinfect if your coop has a parasite problem, visible on your chickens or around bedding. Freshen coop with new bedding. Clean the outside pen by raking, removing clumps of maure. Level the outside pen floor. Mix in finished humus from composting into one of your needed garden beds. Take care of any chicken coop repairs or parts that need to be replaced from wear and tear. Implement any seasonal adjustments as needed when moving into warmer and cooler temperatures in your climate. Deep clean the coop. Remove manure box, roost if you can, and wash down, scrub, disinfect, and let dry in the sun. Worm your chickens at least twice a year, spring and fall are good times. Assess your chicken flock. Will you be adding more hens? Ordering baby chicks? Do you need to add on to chicken coop? Do your free-range chickens need more outside runs?